One day I found myself with an unopened jar of kimchi from H-Mart in my fridge and realized that I needed to use it quickly before it got so fermented that it would become like a solidified savory soda. What became of it has become a favorite! I love Korean food and I love kimchi! Due to natural fermentation, kimchi is packed with gut-healthy bacterial probiotics. I love not only the flavor but also the health benefits. On top of that, Chinese broccoli, or gai lan, is a dark leafy green that is packed with vitamins and minerals. You’re also getting protein from the soft boiled egg. Traditionally bibimbap is topped with a fried egg but I wanted to get the same yolky effect with less saturated fat from butter or oil. 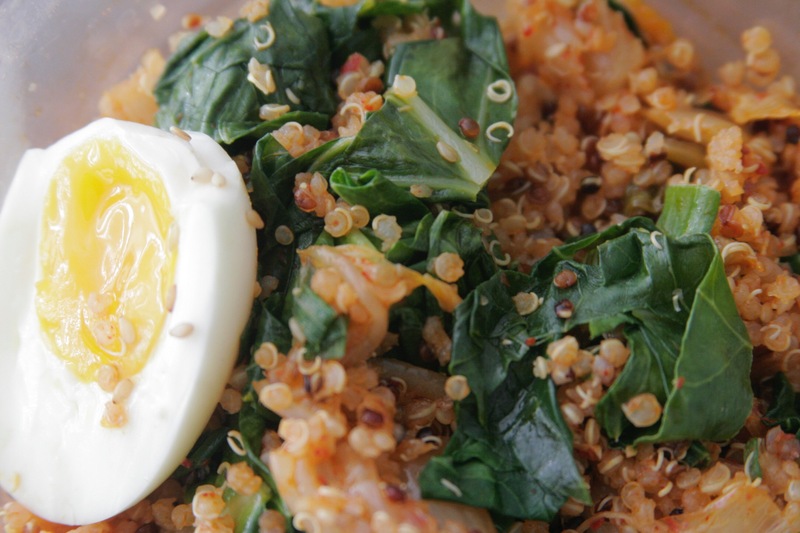 Quinoa is a great alternative to rice, with no gluten and more amino acids and antioxidants. I like the visual appeal of tri-colored quinoa, but any variety will work. This balanced, delicious meal is the perfect lunch to carry you through the rest of your work day! Thoroughly rinse your quinoa and drain. In a medium saucepan combine the rinsed quinoa and your water. Bring to a boil. Once boiling, reduce heat to low, and simmer the quinoa for 15 minutes. Remove from heat but keep the lid on for another 5 minutes. Then fluff with a fork and set aside. In a wok or a large skillet, heat the sesame oil over medium heat. Carefully add the ginger and garlic and stir for about 2 minutes or until fragrant. Add the cooked quinoa and the chopped kimchi and cook, stirring frequently, for another 3-4 minutes. Add in the kimchi juice, liquid aminos and gochujang, stirring to incorporate. Once fully mixed, reduce heat to low and stir occasionally until it’s time to assemble your bowls. In another small saucepan bring some water to a boil. Gently add your eggs, reduce heat to low and simmer for 6 minutes. Immediately remove eggs from the pot in to a bowl of ice and water to stop cooking the eggs. Peel and set aside. While the quinoa mixture is hanging out and the eggs are boiling, quickly steam your broccoli greens for about 1 minute until barely softened. Do not overcook the greens or they will become soggy. Now it’s time to assemble your bowls. Divide the kimchi quinoa amongst 4 bowls, should be about 3/4 cup per serving. 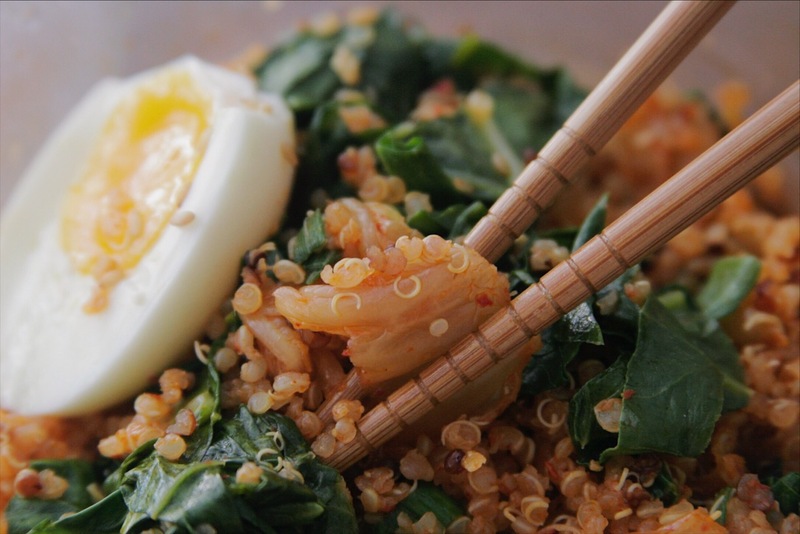 Next top with your softened broccoli greens, sliced green onions, half of a soft-boiled egg, and toasted sesame seeds. Can be eaten immediately or packed away for a week of delicious, flavor-packed bowls that are jam packed with good for you benefits for lunch or dinner.